A gluten free cake recipe can be completely flourless. In fact I've discovered lots of cakes from around the world that are traditionally made without gluten, and many are completely grain free. Often they are made with almond meal, but some are even nut free, like this Mexican cake recipe that's made with garbanzo beans. Some versions of this bean cake recipe are flavored with cinnamon and raisins, and are more like pudding cakes. This one has beaten egg whites so it’s lighter, but satisfying. I would describe it as halfway between a pudding cake and a sponge cake. I had a hankering for lemon, so this is a lemon version. Instead of flour, garbanzo beans are puréed with other ingredients, then folded into beaten egg whites. It’s a low carb cake if you use a sugar substitute. 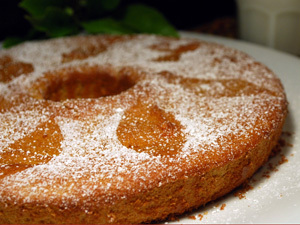 The cake has a fine crumb compared to flourless cake made with almonds. It’s very moist, but still light. If you try this recipe, please let us know how it turned out. Preheat oven to 350º F, and grease the bottom only of an angel food cake pan, or spring form pan. Leaving the sides ungreased helps the cake climb as it bakes. Purée the beans in a food processor. Pulse in the egg yolks, sugar, baking powder and lemon zest. Beat the egg whites until stiff, adding the tiniest pinch of salt to stabilize them. Gently fold the bean mixture into the egg whites until most of the egg white disappears. Pour into the angel food cake pan, or spring form pan with center. Bake at 350º for 55 minutes, or until tester comes out clean. If possible, invert the cake to cool by setting it on top of a metal funnel or a bottle. (Make sure it can’t fall over.) This prevents the cake from falling, although it may still contract some. When cool, run a knife around the edges of the pan and remove the outer ring. Run a knife beneath the bottom of the cake to release it from the pan. Place on a serving plate, sprinkle with the lemon juice, then lightly with confectioner’s sugar. This recipe was based on the Torta de Garbanzo in The Mexican Cookbook by George and Inger Wallace, a book full of authentic Mexican recipes and stories. I combined that recipe with another long lost reference that had lemon in it. This is a great flourless cake recipe to know about because it can be made with other flavorings. Substitute ½ t cinnamon for the lemon zest, and add a cup of raisins. This will make the cake heavier, so it should be baked in a cake pan. 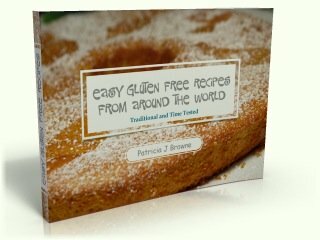 Get a really easy version of this gluten free cake recipe by signing up for my FREE monthly ezine. If you’d like a zester that makes short work of zesting citrus or ginger, my favorite is the Microplane Fine Grater. It has razor sharp cutting teeth and a plastic sheathe to protect you when it’s in your drawer, and to prevent dulling. It’s also much easier to collect the zest, and to clean, than the old style graters. It’s one of my favorite toys.